Nothing says spring better then a beautiful bouquet of fresh cut tulips. After cold winter months these cheerful blooms often signify that warm weather is around the corner. As the world’s third most popular flower, tulips are in great demand all over the world. Every year billions of tulips are cultivated with the majority being exported from Holland. Tulips come in a wide variety of vibrant colors such as red, yellow, orange, purple, pink, and bi-colors. Whatever the color, tulips can be utilized in a multitude of ways including, home decoration, special occasion bouquets, or wedding centerpieces. These elegant flowers are said to signify a token of a perfect lover, passion, love, declaration of love, romance, fame, charity, and dreaminess. Often tulips can be thought as a mischievous bloom that has a life of their own. The reason tulips never seem to stay in the spot where they were arranged is because unlike other flowers, tulips keep growing after being cut. To insure the longest vase life, buy tulips that are just starting to open. Before arranging, it is important to re-cut the base of the stem at an angle. 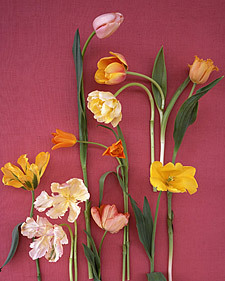 Tulips are a thirsty flower and cutting the stem at an angle will help open up the flower’s water uptake channels. As with any flower arrangement check water levels daily and change when necessary for the longest vase life. You can expect to enjoy these charming stems for three to seven days. Posted in Home Decor and tagged centerpieces, marthastewart.com, sioux falls florist, sioux falls flowers, south dakota florist, south dakota flowers, spring, tulips.